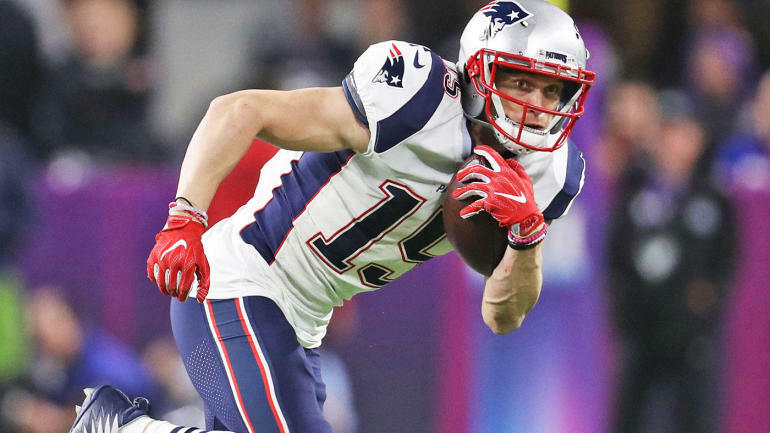 The Carolina Panthers have signed Chris Hogan to a one-year deal, the team announced Friday, and he’ll join a receivers group that includes D.J. Moore, Jarius Wright, Curtis Samuel, Torrey Smith — and running back Christian McCaffrey, who led the team in catches last season with 107. Hogan, 30, fills a roster spot made available when Devin Funchess signed with the Colts in free agency. Hogan, who spent the previous three seasons with the Patriots, where he won two Super Bowls, had 35 receptions for 532 yards and three touchdowns in 2018. He ranked 20th in value per play among all receivers, according to Football Outsiders’ metrics. By comparison, Funchess, who had 44 receptions for 549 yards and four scores, wasn’t even replacement level, ranking 62nd in value per play. Signing Hogan also means the Panthers can target other needs in the draft. In our most recent mock draft, we had the team taking Notre Dame wide receiver Miles Boykin in the third round. Now, Carolina can look to add depth at pass rusher, offensive line, safety and possibly even quarterback. Hogan went undrafted out of Monmouth in 2011 and played for the Bills from 2012-15 before joining the Patriots.